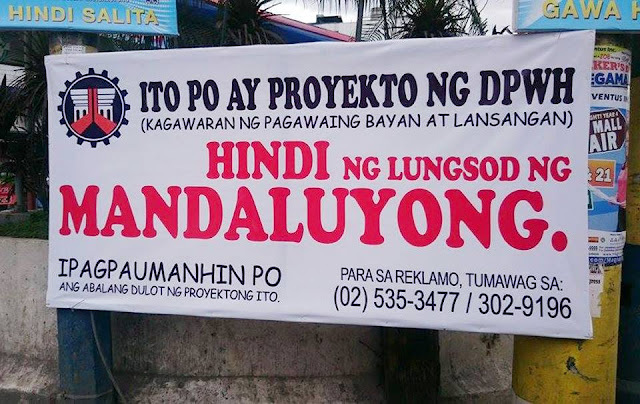 MANILA, Philippines- To express dismay over a slow-paced flood control project in Mandaluyong, the city government put up several signs blaming the Department of Public Works and Highways (DPWH). According to Velasco, several signs like this were put up in the city after a netizen posted a complaint about the said flood control project. A report by Inquirer revealed that the ongoing drainage improvement project of the DPWH began as early as January 2013. Because of the delay in the completion of the project, foul-smelling stagnant water surrounding portions of Boni Avenue, Maysilo Circilo and adjacent streets has brought inconvenience to residents, motorists and businessmen in the area. In order to address such complaints, Abalos wrote to DPWH Secretary Rogelio Singson. “While the project is owned and operated by your department, [the] city government continues to be blamed and criticized for [it],” he wrote in his letter. In addition, Abalos urged Singson to produce a detailed plan of the project including the progress and expected completion date which he could show to residents. Meanwhile, the DPWH website indicates that the project is set to be completed by May 30 this year and about 54% of the project has been completed as of December 31, 2015. On Tuesday, February 2, Abalos disclosed that Singson apologized to him for the criticisms and inconvenience the local government of Mandaluyong faced brought about by DPWH’s flood control project. Singson also promised Abalos that he will look into the issue and will ensure that L.R. Tiqui Builders Inc., the contractor, would speed up the completion of the project.